If you are a fan of overpriced jelly sticks covered in chocolate, try out this simple two ingredient recipe. I have tried a few different brands of candy orange slices and my favorite is the Great Value brand from Walmart. I think it has the best orange flavor, more so than Brach's brand. For the chocolate, I used chocolate almond bark which I find melts much smoother, faster and easier than regular chocolate chips. I hadn't used 'almond bark' chocolate until the past year but I love it for dipping cookies or candies. Chocolate chips can be a bit temperamental and thicken up but the chocolate bark stays nice and smooth. Many thanks to Blissful Roots for the inspiration for this recipe. 1. Break the almond bark into squares and place in a microwaveable dish. Heat in the microwave for 30 seconds at a time, stirring after every 30 seconds. Stir well to get the bark smooth. 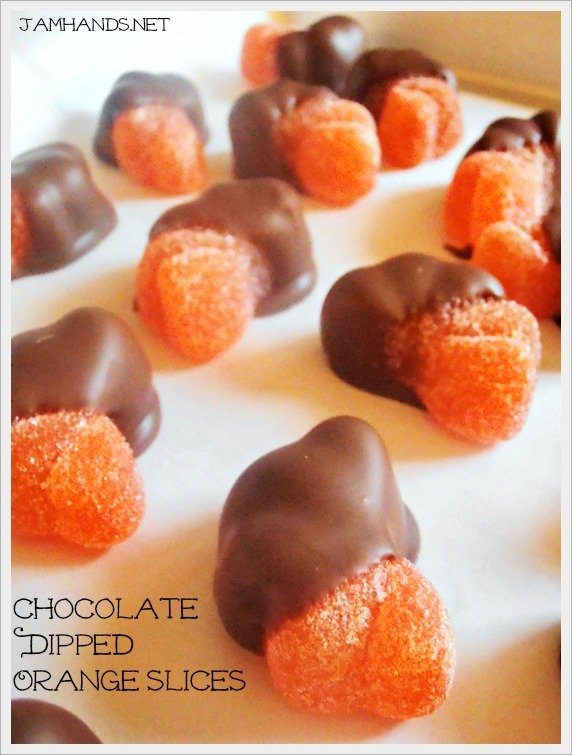 Dip the orange slices in the chocolate and lay on a piece of parchment paper to set up. Once set, keep in a tin or tupperware container. Mmm! I LOVE this idea. So simple and oh-so yummy!!! These would be perfect for today. Apparently December 16th is "Anything covered in chocolate day"